ET is coming home. 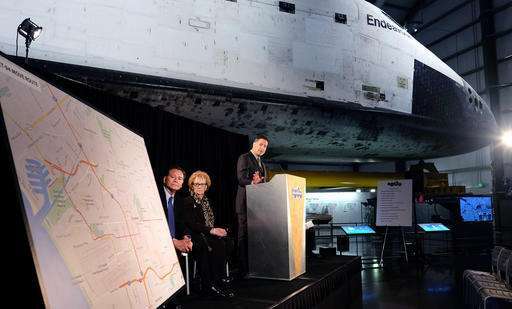 ET-94, a massive external fuel tank built for the space shuttle program but never used in flight, will finally take an epic journey—not in space, but through the Panama Canal and eventually along the busy roadways of Los Angeles, it was announced Thursday. The 32½-ton tank is destined for the California Science Center, permanent home of the retired space shuttle Endeavour. The tank is 27.6 feet in diameter and 154 feet long—longer than the shuttle, although it weighs less than half as much. ET-94 is the last surviving external propellant tank that was built for shuttle missions, since such tanks were designed to be expendable. However, three test tanks remain. Museum officials outlined its six-to-eight week journey, which begins in mid-April by barge from a NASA assembly facility in New Orleans. The tank then passes through the Panama Canal and docks at Marina del Rey, California, for the start of a 12-mile journey on highways and streets to the downtown Los Angeles museum. The road trip is expected to take 13 to 18 hours, with the tank arriving at the museum around May 21. Thousands of people watched as the Endeavour made its final journey through the streets of Los Angeles and Inglewood in 2012. To prepare the way, an army of workers cut down hundreds of trees, raised telephone lines and covered streets with steel plates to protect underground wiring. Traffic signals and light poles also were temporarily removed. Lying on its side, the cylindrical tank isn't as high or wide as the shuttle and no trees will be removed, although some may have to be trimmed, museum officials said. The $3 million cost of the move also is much less than the $10 million or so it cost to fly the Endeavour into Los Angeles on the back of a Boeing 747 jet, then roll it through the streets. The tank was designed to hold oxygen and hydrogen used to fuel the engines that boosted shuttles into orbit. The tank would then drop off and either burn up in the atmosphere or plunge into the ocean. Although the tank destined for the museum never flew, it played an important role in the investigation of the space shuttle Columbia disaster. The shuttle broke up while re-entering Earth's atmosphere on Feb. 1, 2003, killing all seven crew members. It was determined that a piece of foam insulation broke off from the external tank shortly after launch and struck the shuttle's wing, causing damage that allowed heat and wind to destroy the wing during reentry. During the investigation, pieces of insulating foam were taken from ET-94 for examination. 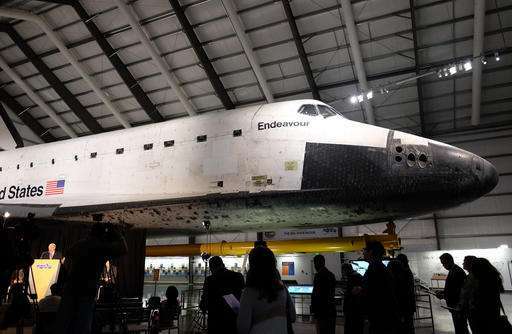 Endeavour leaves Houston for new home in Calif.